UPDATE: The Hidden Artists Art Reception on Sept. 7 is cancelled. The reception date has been rescheduled for Thursday, Sept. 21 @ 4-6 p.m. in the John C. Hitt Library room 223. 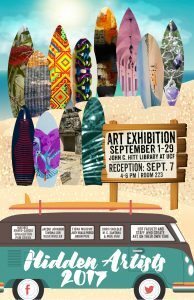 The Hidden Artists will exhibit at the John C. Hitt Library from September 1-29, 2017 with a reception on September 21. Artwork will be exhibited in the library on the Art Wall and in the glass display cases with a variety of styles, subjects and mediums, including photography, mixed media, acrylic, graphic and jewelry. The exhibit features the talents of: Maribel Amaro-Garcia, Gina Clifton, Pamela Williams Gruen, Jacqui Johnson, Simona Loh, Russ Muller, Fiona Murphy, Judy Bragg Pardo, Brian Pate, Christopher Saclolo, M.C. Santana, and Paul Viau. Visit the Hidden Artists on Facebook at: www.facebook.com/hiddenartists  and click “Like.” to follow the group. Hidden Artists membership is open to currently working UCF faculty or staff members who create artwork. For more information, email Judy Bragg Pardo at: judyart23@aol.com . The University of Central Florida John C. Hitt Library is located at 4000 Central Florida Blvd., Orlando, FL 32816. Call the library for hours of operation at 407.823.2580 or visit the website at library.ucf.edu.